Invent your way to an empire! 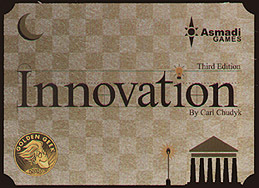 Innovation is a card-driven journey through humanity's ideas and advancements from prehistory all the way to The Internet. You must strategically combine the abilities of your technologies to succeed! Each card depicts one of 105 historical innovations, with effects that allow you to advance your society and sometimes attack your opponents. While the basic rules of the game are simple, managing the different cards becomes an intriguing puzzle. Can you claim enough achievements before technology moves past you?